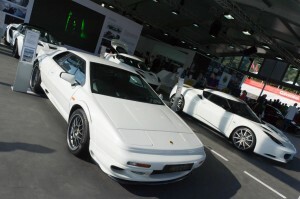 Bahar may not have been able to deliver the new Esprit before being ousted from his role as CEO at Lotus, but he did manage to get one built before his departure – a completely rebuilt 2002 Esprit V8. The car will be up for sale shortly, but PistonHeads have managed to get behind the wheel of the car on Lotus’s Hethel test track and tell a bit of the story behind what must be one of the best condition Esprits in the world. This entry was posted in Group Lotus and tagged Dany Bahar, Esprit, Hethel, PistonHeads, Rebuild, V8. Bookmark the permalink.